Interestingly of the methods talked about to create a hardware cartridge dumper one of them is possible with my MMU Adapter by simply connecting four wires and a DPDT switch. I have tested that the hardware modification works, but then it becomes a question if the software(The Cartridge Dumper utility) created by Jindrich Kubec to dump to a file will work. So far I have had little success in operating the software as is claimed in this internet article. A thread on AtariAge seemed to indicate that the little utility was never really meant for public use and therefore left much to be desired as far as user friendliness. I would have to agree. Perhaps someone can tinker with it and/or create a utility that will be more friendly to use. There are other means to dump a cartridge to a file, and little reason to now as most carts have been dumped and are available for download. But the tinkerer in me likes to make my own just to see if it will work. 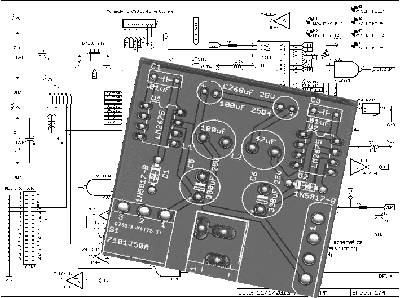 I have added the schematic to the MMU adapter documents. Recieved what I hope is the final proto boards in Monday. Over the last few days I have soldered in all the essential parts. Not the front panel mods. That area is still in development and could change. But all parts necessary for the operation of the board have been soldered in except for the power and data cable for the drive. I have power tested the board and nothing blows up, some chips get warm but no sauna chips and no exploding caps or resistors. Since there are no Sam’s manual for the XF551 and therefor no documented measurements I can check against, that may mean nothing at all, but I am cautiously optimistic. Next up is the attachment of the power and data cables for the floppy and the installation of the board and drive into the case. Then the next major test is the power up w/o connection to the Atari. Does the drive power up like a normal XF551? Is there backfeed through the SIO connectors etc? I don’t want to fry an Atari computer. I am using the modern format XF551 to test with. It should prove the hardest to get up and running. What I learn here on this one will allow me to get the original setup quicker. I suppose I could have gone the other way around but I only had enough money to send 1 board format to manufacture. $80 for 5 boards 15cm X 15cm plus shipping. It ain’t cheap. Next update should come by the end of this next week. Decided against doing the OSC and LED test boards. The OSC mod just allows a 33.333MHZ OSC to be used instead of the Atari specific 8.333MHz. Igor has already tested his LED mods. So I sent what I hope to be the final proto board to the board house. I should get it in sometime next week. In the mean time I am sourcing parts and trying to shave as much cost off the board production as I can without losing quality. Right now it’s looking like the board costs are running around $80.00 for the basic board with $20 more getting you the front panel parts and boards. Stay tuned. [dropcap]O[/dropcap]kay time for an update. I recieved the modern power supply test board about a week or two ago. Soldered everything in and it is working with a 24V 1.5 A DC wall plugin. So that is a big step for the modern version of the XF551. I am currently about ready to send the alternate osc circuit and the LED test boards to Itead for manufacture. In about two weeks or so when they come in I can test them and if they pass, that’ll be the final phase before sending the complete modern XF551 board in. Not so good for the original power supply test board. I got the test board in yesterday and finished soldering the parts in tonight. It didn’t blow or let out black smoke but there is no voltage at the drive connector. I know the Atari transformer is working because I can power a 1050 with it. So either I wired the DPDT switch wrong or something else in the wiring is wrong. So it’s back to the schematics to see if I can rewire the test board to see if I can get it to work. Yipee! It was in the schematic. Had the switch wired wrong. Cut the wrong trace and wired it right. Success!!! Now both the modern and original power supplies are working. While waiting for the new boards to arrive I got to playing with an idea I’d had for awhile. I use the board house Itead Studio and I’d recently changed from using Eagle to Diptrace for my PCB design software. Well Itead requires a specific file extension for each gerber file. I was getting tired of manually changing the extension on the gerber files Diptrace creates and occasionally getting the wrong extension on the right file. Horrors!! Here’s the link for .Net Framework 4.5. Download the setup file and install. You will need to be connected to the internet. Then go ahead and download my program Diptrace2Itead and unzip. Run the setup.exe. It’s a simple little program. No documentation to speak of. It sticks the zip file in the project directory by default. I’m sure someone will discover a bug. 🙂 I may upgrade features later, but for right now it does what I need and I don’t need anything else for it to do. A big question remains. I am considering going to a four layer board, but my current board house prices for four layer boards is literally five times more expensive for a small batch. (50 count) So I may have to stay with 2 layer. It might not do much to reduce the size anyway. I am working with non SMD parts for the most part. It would be nice to go SMD, but I see no realistic way I can do that much SMD soldering. My eyesight just will not allow it. I’ve toyed with the idea of having my board house do the SMD assembly, but the additional costs could push the total cost of the board beyond that sweet spot that most Atarians will pay. Kinda defeats the purpose. Anyway, I have a couple more projects in development too. Those boards should come in this week too. Stay tuned for more info. A few days in now to this great experiment. I’ve had some customers and a major meltdown in the shipping module due to an ill considered update. But every thing seems to functioning now. I’m still not very sure the shipping module is doing what it should the way I want it to, but it’s what I have right now. Major snow and ice storm occuring now. Here’s hoping everyone in it’s path is safe and warm. [dropcap]X[/dropcap]F551 was Atari’s attempt to use the more standard 5 1/4 disk drive with it’s 8bit computer line. It was released as the company faced certain failure and suffered from Tramel’s cost cutting mentality. The single sided near perfboard quality main board is much maligned for it’s frequent power and SIO connector failures. I never owned a XF551 Floppy Drive back in the day. I lusted after it, but never quite could afford it. And then life intervened and I moved on. Fast forward some twenty years. I finally have the means and the knowledge to own and fix some of the short commings of that floppy drive board. I started this project a little over a year ago as a summer project. After some success with the GTIA-PAL adapter board and the MMU adapter board for Candle’s Ultimate 1MB, I was feeling my oats so to speak. I thought I would stretch myself. And I thought I would have some fun even if I didn’t succeed. As you can tell, it’s turned into something more than a summer project. Along the way I stretched myself way out of shape. 🙂 But it has been very fun. Legacy Atari 3rd party hardware boards… These products, while technically may not be abandoned by their respective makers, are not being supported or manufactured and have not in twenty years or more. I wanted to keep alive as much of the original experience of owning them as possible by reproducing the physical boards. This website is a direct result of that. [/quote]Okay, let’s start at the beginning. In the beginning I wanted to fix the obvious flaws mentioned above. I also at first did not want to include internal power supply circuitry. There was much disscusion in the thread I started on AtariAge on the advantages/disadvantages of that. 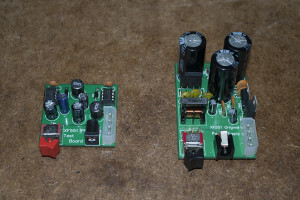 It seemed split evenly and I was without enough information to recreate the original power supply circuit. I later ordered a copy of the preliminary XF551 schematic from Best Electronics and found most of the information there. But not all. Key parts were not labeled with values and a close inspection of the board parts yielded no more info. So finally I decided to forego internal power supply. Then it became a question on how to get both 5V and 12V to the drive and chips inside. That’s where I got stuck for months. I tried different schemes. 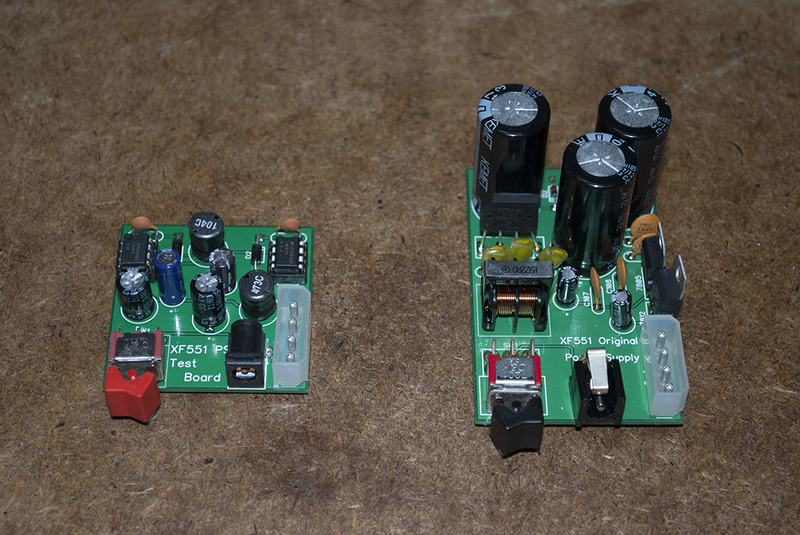 Had multiple proto boards made and had them fail miseribly. Each cycle took almost a month for the redesign, board manufacture and receipt, assembly and testing. I could only work on it parttime as I have a full time job. Guss Assmman provided immeasurable help, even going so far as sending his own working board and testing one of my proto boards. I kept finding mistakes I had made, some assumptions I should have known better than to make. Okay I was learning……. but it was begining not to be fun anymore. Family emergencies didn’t help, at one point stopping work cold for several months. That work stoppage and a decision to put the project on hold for awhile allowed me to gain some distance and allowed my subconcious to work in the background. In the meantime I directed my attention to other ideas that had been bubbling on the side. Okay here we are nearly a year and a half later after starting this project. From the knowledge and additional experience gained by smaller projects I think I can resume and complete this now. I continued to research anything and everything about the XF551 in the meantime. During my research I came across Igor Gramblicka’s website http://blog.3b2.sk/igi/ . He has created/designed some fantastic mods for the XF551. He has graceously given permission to allow me to incorporate some of them into my project. [dropcap]W[/dropcap]elcome to Bits of the Past. I hope to provide some entertainment to those interested in the once and forever Atari 8 bit computers. I also hope to keep alive some of the old school mods that were originally designed but have been abandoned by their creators. Copyright laws were created to encourage invention and to protect those inventors by providing the ability to profit from their designs. If the creators abandon those designs or fail to maintain production, then the most they should expect is attribution which I will freely give. I am not making a profit, I have no intention to make a profit. Now I do have a few original boards of my own and those I would like to make a little money on. We’ll see. This will be a work in progress for a few weeks while all the bugs are squashed and I apologize before hand if the site blows up while you are trying to order. I will confirm all orders before shipping so your valid email address is extremely important. Especially for those who live over the big pond.